Effective meetings are key to a productive day. To run a meeting you start it, add attendees, take notes and finally share them. Here is a guide to help you get started. Once you sync the calendar, your meetings will appear at the top of the dashboard. Start a meeting by clicking on a meeting card. If you have not synced your calendar start taking notes by clicking on "Create Note". Next, invite colleagues to view and collaborate on notes. 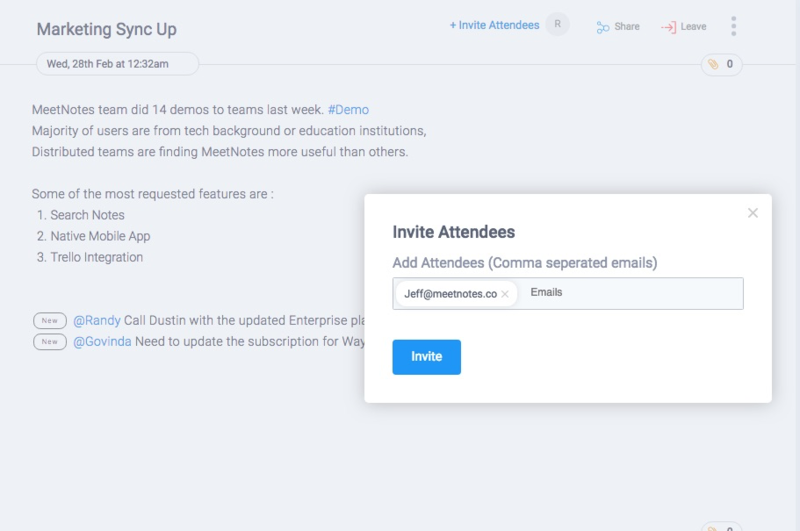 Click on “Invite Attendees” in the meeting header and enter their email addresses. 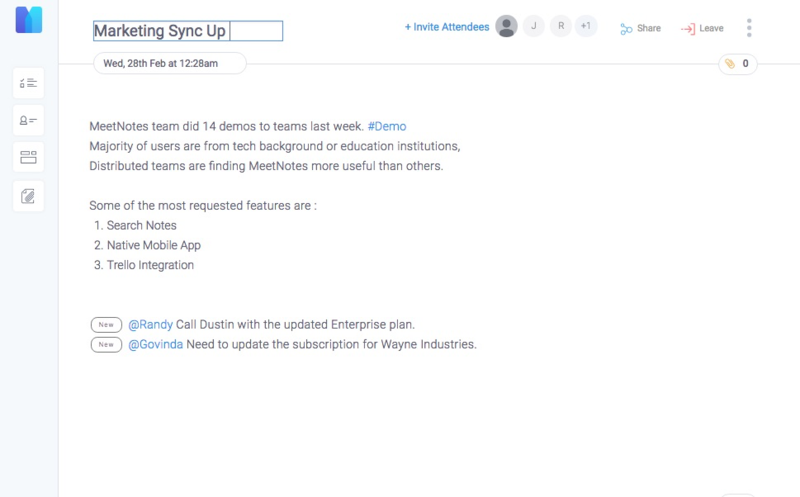 For meetings synced from your calendar, attendee list is already populated. Add a descriptive meeting title at the top of the meeting editor. This will help you find meeting notes later. Use interactive widgets on the left to add Agenda, Action Item ,Templates and Files to your meeting. The right section displays all action items from current and previous meetings, arranged under respective meeting attendees. If you want an overview of action items from all your meetings, go to the action item page . 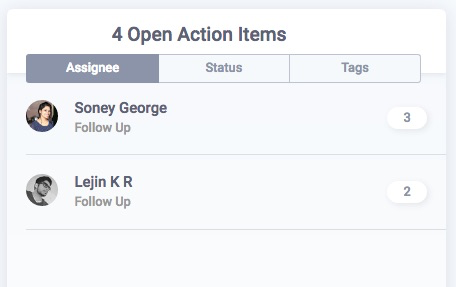 You can view individual attendee's action items by clicking on the number beside their name. 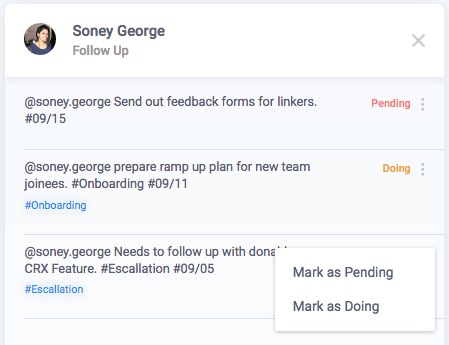 As you start working on assigned action items, you can update their status from pending to doing and done. Refer to Share Notes article to learn about sharing notes in MeetNotes. 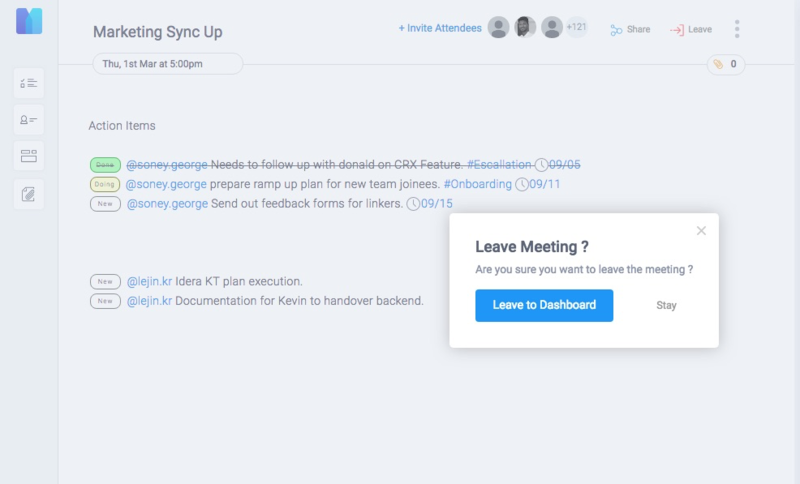 Once the meeting is over, click on the Leave button at the top right corner to return to the dashboard. That was how to run a meeting in a nutshell. So login now and give it a try!